Day 23: I Found My Happy Place, Have You? 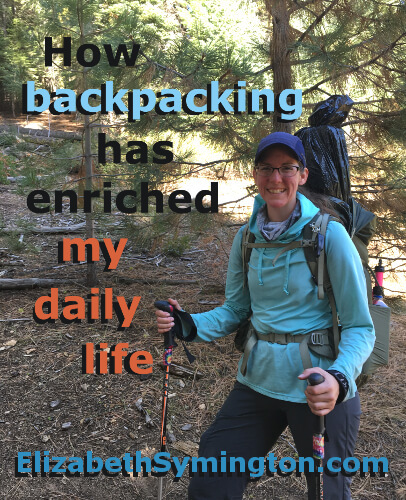 This is Day 23 of the 31 day series on “How backpacking has enriched my daily life.” I expected lightweight backpacking to be a hobby. Instead it has transformed me for the better. Even before I got into backpacking I knew that I’m a happier person after I’ve spent the day exercising outside. When I’m in nature I turn into a little kid who can’t get enough of animal foot prints and dead butterflies! I want to identify them all, so I take a lot of photos for reference. I was on a solo hike, marveling at how white and magical the snow made everything. 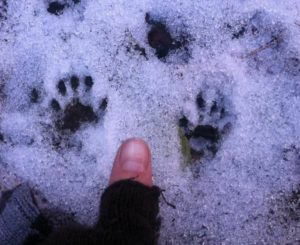 That’s when I discovered these tiny paw prints! I still squeal every time I look at this photo. I’m guessing they belonged to a tree squirrel because ground squirrels hibernate and these prints were on the ground connecting one tree to another. Bedtime reading for me is flipping through John Muir Law’s Sierra Nevada Guide Book. I like learning about plants and animals in the area that I might see on a hike. One succulent that kept alluding me was the Snow plant. Upon reading about this chlorophyll-free parasitic succulent, I knew I had to see him in real life. I finally got my chance to see a Snow plant while hiking with my boyfriend. I spotted these vibrant colored plants popping up out of the ground at the base of a tree and I just about lost my mind. 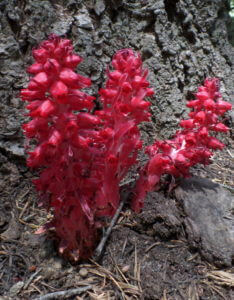 I could barely hold still long enough to take the photos before running to the next clump of Snow plants. It was dark out and two sets of eyes shined back at me, about an inch above the ground. I had to investigate and that’s when I exposed these tree frogs having a private moment. I felt like a nature photographer who just stumbled across my next big break. 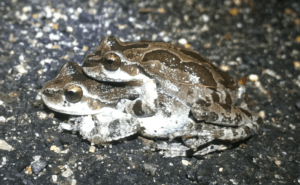 Since how I already interrupted these frogs, I took some photos and a video where the lady frog is tapping her fingers from impatience, possibly directed at me or maybe at her partner. This is a screenshot of a video that I filmed on my old iphone 4. I was hiking solo and I saw my first bobcat! 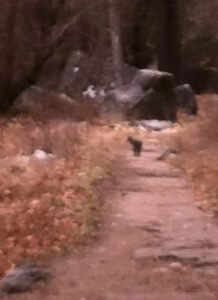 The dark blurry, blob that’s on the trail is the bobcat. He was unphased by my presence, even though I was yelling at him to move it along, so I took a video of him. That was such a treat getting to see a wild cat, the first of many! I was out hiking in Yosemite and I came across this memorial plaque to Stephen Mather, the founder of the National Park Service. I was intrigued by the end of the inscription that read, “There will never come an end to the good he has done,” and it got me thinking about the legacy that I would like to leave. I shared this with my boyfriend who is also a fan of Mr. Mather. He was curious to look at the plaque, so I gave him clues on where it was located. 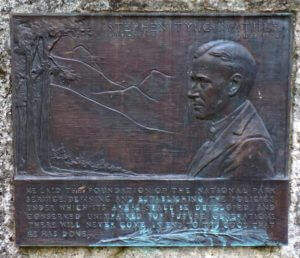 Over the next year I gave him even more clues on the location of the plaque, like its by a bridge in Yosemite Valley. Ironically my boyfriend gave me a biography on Mr. Mather and it said in there where to find this plaque! He didn’t even know that he had the answer in his grasp! I don’t remember if he ever found the plaque or if he finally just looked it up online. Several other National Parks have a matching memorial, which would be fun to turn into a photo scavenger hunt! There you go; backpacking brings out my silly, playful, happy side. Thank you sunshine and nature for healing my soul.